These pages offer some suggestions for facilitating a group discussion and/or exercises on the main themes raised in this chapter. Aims: To decide on the questions that you want to answer and to practise gathering data that you can use to answer your research questions. Your group will need computers and access to the internet. Step 1: In groups of two, discuss and decide on two research questions that you would like to answer in your context. Step 2: Go back through Chapter 3 and decide what kinds of data you will need to answer your research questions. Step 3: Using the Namibia example (on pages 8–9), use the internet to start gathering information on the legal framework of tax in your country, legislation in your country, and data from the ministry of finance or other government department on tax revenue trends. Step 4: On the basis of what you have been able to find, go back to your research questions and consider whether you think they are feasible in the time frame and resources you have available. Aim: To practise gathering data on subsidiaries as a first step towards analysing company accounts. Step 1: Choose a multinational company (MNC) that you know trades in your country. Step 2: In groups of two, go back through Chapter 3 and use the database resources to find out which subsidiaries the company owns or part owns in your country (each group could choose a different country). 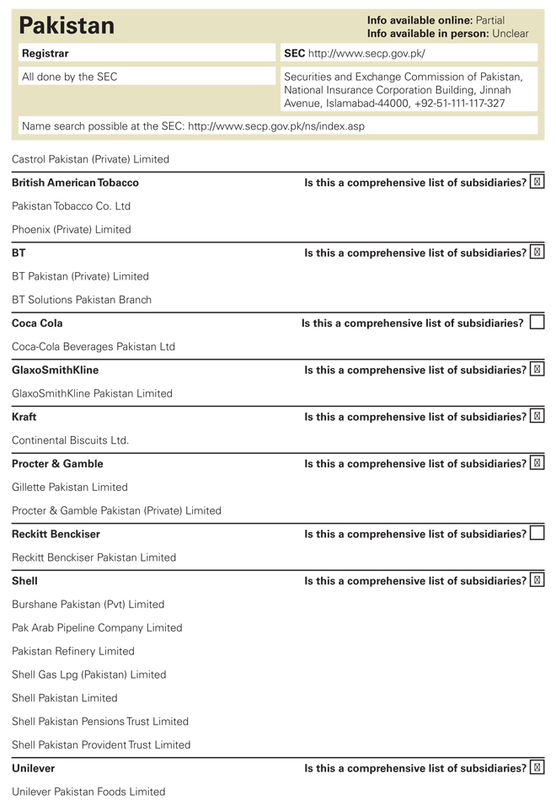 The example country information sheet opposite lists the subsidiary companies in Pakistan for which data could be gathered, grouped according to the MNC of which they are subsidiaries. Report back to plenary on what you have found. Step 3: In groups of two, use internet searches to gather information on these local subsidiaries. You may be able to access this information online from your companies’ registry/registrar general or the Securities Exchange Commission. In particular you should look for four pieces of information. The companies to investigate should all be >50% owned by the MNC, usually via one or more other subsidiary companies. Note what you have been able to find, where you need to go to find additional information and where you think the gaps lie. Report back to plenary on what you have found. Depending on your context, it may be impossible to access this information online without paying a fee. the tax contribution of companies in order to analyse how much a particular company is paying in tax and whether tax avoidance or evasion is likely.